We are surprised that this is happening again. Because it had happened just last year in the summer, which was one of the hottest recorded in recent memory. And the previous year in the summer. And the previous year again. Despite doing nothing to prevent a recurrence, it is recurring. Isn’t it surprising? It is a surprise that summer is coming back at all. With its many surprises. We will be surprised to see peak load requirement going up in the summer as more and more people switch on their air-conditioners. We will be surprised to experience frequent failures in the grid-supplied power as the grid buckles under peak-load demand. We will be surprised when residential societies as well as commercial developments switch on their diesel-powered generation sets and produce their own power to offset the grid failures. We will also be surprised that noxious fumes emitted by these generators will add to the pollution woes of the city. We will be surprised when, despite uncontrolled drawing of ground water for industrial and other uses, the water table plunges further. We were expecting November-like bracing conditions to prevail through most of May and June, but looks like IMD had other ideas. If putting out realistic and reasonable facts and figures is all it can do, does a rapidly developing nation like ours really need an IMD? But that is for our political leaders to answer. Let us enjoy the beauty of life while we can. With its ability to throw up surprises every day and every minute. Summer will be followed by monsoon. Yet another surprise. Seriously, did anyone know about this? Come monsoon and we will be surprised to realise that water can flow from higher to lower level of ground. And that constructing in its path without adequate assessment of capacity will lead to impeding the flow of water and cause water-logging. We will be surprised to know that open ground absorbs rainwater much faster than land that has been constructed over. As a corollary, we will be surprised to realise that slower absorption of rainwater leads to a slower recharging of groundwater resources. We will be surprised to know that that poor quality material used in building of roads leads to the surface being washed away leaving gaping holes for traffic to navigate. We will be equally surprised to understand that gaping holes in the road surface and water-logging on roads leaves only narrow usable channels for traffic on otherwise wide roads, which leads to massive traffic jams with people leaving office at 6 PM reaching home 15 km away at 5 AM the next morning. We will be surprised to realise that rainfall does not have a mechanism through which it can stay away from areas prone to water-logging and poor drainage. We will be surprised to know that random dumping of waste and stagnant water is a toxic combination that leads to breeding of mosquitoes, among other vectors, that leads to the spread of malaria, chikangunya, dengue and other diseases. As a corollary, we are even more surprised to learn that preventing collection of stagnant water and keeping our surroundings clean can prevent vector-borne diseases to a great degree. It is a surprise that these are happening again. Because they had happened just last year during the monsoon. And the previous year in the monsoon. And the previous year again. Despite doing nothing to prevent a recurrence, they are recurring. Isn’t it surprising? And if that is not enough of surprises, winter, which just about got over, will come back. Did you know that? We will be surprised that the cold winter air, with all noxious fumes and other pollutants emitted into it, will hang low and not get dissipated as easily as in the non-winter months, when it blows the pollutants away to unsuspecting people in other geographies. We will be surprised that respiratory issues will abound in the winter months and that the masks people wear are not a natural adaptation of the human species to environmental stimuli. We will be surprised that the days are short and nights long. We will be surprised that it gets cold. It is a surprise that these are happening again. Because they had happened just last year in the winter. And the previous year in the winter. And the previous year again. Despite doing nothing to prevent a recurrence, they are recurring. Isn’t it surprising? And then, surprise of surprises, maybe even a shock, summer will be back. Who could have predicted that? I stepped out onto my balcony and opened my lungs. I could finally breathe. The air quality had improved. Future generations, coming after we have fully developed our society, may find it hard to believe. But it was true for us. The air quality improved and finally became very poor. From unfit for human consumption just a day earlier. It came like a breath of fresh air. Or at least like a breath of very poor quality fresh air. I breathed deeply. I was afraid it may not last and wanted to drink enough to last me till the next opportunity. Who knows how many of us would live to see the next occurrence. And, like all good things, or at least very poor quality good things, it vanished almost as soon as it had come. The Indian Meteorological Department has blamed the once-again unfit for human consumption air to the stagnant air that was a result of a depression in the Bay of Bengal that normally results in gale-force winds. The stagnant air apparently led to the particulate matter hanging in the air above us not being blown away to hang in the air above people in other locations, and be replaced by other particulate matter hanging in the air above people in other locations blown in to hang in the air above us. As episodes of the depression in the Bay of Bengal and stagnant air happen several times every year, we did not expect it to happen and enervate the atmospheric conditions in Gurgaon. We would not have known in the monsoon season that preceded winter, that winter conditions will set-in in October and create challenges of atmospheric pollution because they have been happening every year and getting worse year after year. And if we did not know in monsoon that winter conditions will set-in in October and create challenges of atmospheric pollution, how could we have known it in the summer months which come even before the monsoon months. Every year. And we know that one can only try to manage something that one knows, or at least knows of. Senior leaders have expressed surprise at the presence of the Bay of Bengal in the Bay of Bengal and believe it is a conspiracy hatched by the previous government. Despite them ruling the country for a good part of the post-independence period, the Bay of Bengal is still in the Bay of Bengal, they indignantly say. Expect a global tender to be floated to move the Bay of Bengal from its current position in the east of the South Indian peninsula, they have announced, in an oblique reference to the soon-to-be-granted mining and exploration rights that are highly regarded for their unique ability to convert any environment to an utter wasteland. But tackling pollution is not something that can be left to the central government alone. Stepping up to the plate, despite being constrained by not knowing that winter will set-in in winter and bring with it challenges of atmospheric pollution, the municipal authorities in Gurgaon have announced a slew of measures, mainly the building of several under and over passes under and over existing roads to make sure more vehicles can ply on the same ground surface area. In fact, the good work begun by them several years back, like that of cutting down hundreds of mature trees on the road leading from HUDA City Centre Metro Station to Signature Towers, on which our housing society lies, to make it possible for an underpass to be built so that more vehicles can travel on the road, is beginning to bear fruit. The spanking new underpass is now operational, blowing clean dust and clean exhaust fumes from fast moving vehicles, and not stale dust and stale exhaust fumes from idling vehicles before the underpass opened, directly onto our building in greater quantities than ever before, helping me realise my closely guarded Hollywood fantasies. I sometimes picture myself as Tom Cruise in “Mission: Impossible – Ghost Protocol” hanging outside Burj Khalifa in Dubai like Spiderman, right in the path of an approaching, freshly-brewed sandstorm. Giant air purifiers that were installed with great fanfare at busy intersections during last year’s handling of the annual crisis, and were the greatest invention since sliced bread, were such a resounding success that nothing has been heard about them ever since. Or perhaps the new under and over passes to accommodate more concurrent vehicles ate up their space as well. Does it matter? After all, only taxpayer money was spent. To become Revenue on someone’s Income statement. The forested Aravalli hills that abut Gurgaon are being proactively prepared to tackle the pollution menace by being urbanised for their own good. 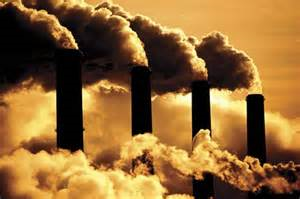 Once they are gone they will not be affected by increasing levels of pollution, is the sound logic heard in offices that matter. Plans have been finalised to place restrictions on using motorised vehicles on roads which will enable the government to encourage people to buy more cars and keep them parked on public property. Even a motorcycle rally to raise awareness about the pollution menace has been announced, demonstrating once again that there is no problem big enough that cannot be addressed by making bold announcements. But we cannot sit on our laurels just as yet. A few days back Chennai topped the worst air quality charts in the country. Despite having the disadvantage of being on the coast and day after day, year after year, seeing atmospheric pollution, created with the hard work and contribution of so many people over years, being blown away by the sea breeze every morning and evening. And it has repeatedly done so. Topped the charts that is. There is work to be done. And miles to go. Preferably participating in a rally to save the environment while driving a fuel-guzzling motorcycle on an underpass, for making space for which mature trees were cut down, to an office complex built on space earlier occupied by the forested Aravalli Hills. It was a scene straight out of a Hollywood horror movie. But without an American hero on hand to save the world. 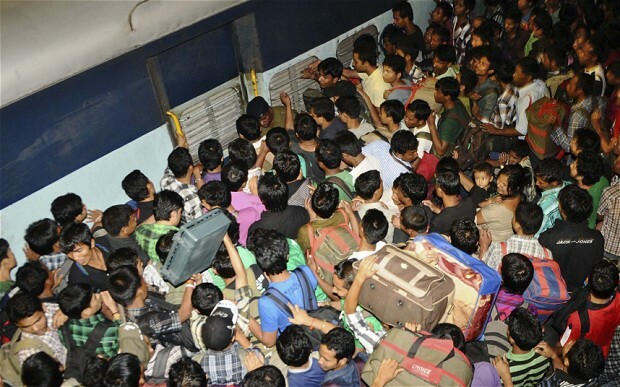 There was shoving and jostling and pushing to catch the next train leaving town. Those who could afford to, packed their cars and fled. The reasonably timely and plentiful rains in and around Delhi have washed away the atmospheric pollution, and with it the last vestige of normalcy, leaving hapless residents gasping for breath in an environment they are not familiar with, clean air. An earthquake of 8+ magnitude on the Richter scale could not have caused such panic. Signs of distress are visible all around. Motorists are in all sorts of trouble. 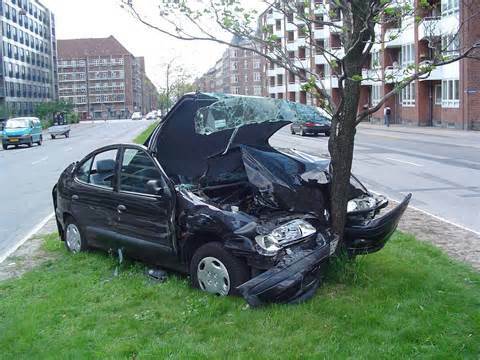 Suddenly able to see far, drivers are having a difficult time keeping their focus on the road immediately ahead, and are bumping into all sorts of objects, including objects off the road. There is just so much visibility that one can handle. Even man’s best friend has not been spared. As can be expected, sports and outdoors people are among the first to be affected. 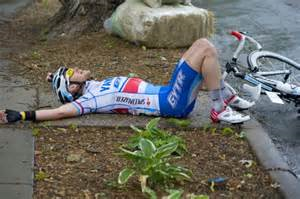 Cycling for health has gained popularity in recent times. But in the situation the city is presently in, cyclists have no option but to hang up their boots. “If there in no pollution about which awareness is to be raised, what is the point of cycling”, is a refrain one is hearing from the cycling community over and over again. And, indeed, from the running community as well. …even as queues at respiratory clinics around the city are rapidly increasing and threatening to go out of control. But nothing like able leaders to show the way during a time of crisis. PM Modi, as has come to be expected of him, was the first to take responsibility. 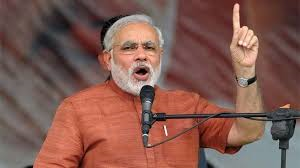 In this TV grab, the PM can be heard saying “bhaiyon behnon, yeh is ungli ka kamaal hai; main chahta hoon ki desh ka har nagrik aur har bachcha apni ungli ka theek istemaal kare” (brothers sisters, it is the magic of this finger; I want every citizen and every child to make proper use of their finger). The faithful, of course, understand that he was implying that he reached up and punctured the clouds with that finger to let the rains come down. Being an intelligent man, after taking credit for what he did not do, and knowing that rains were causing distress to the people, he has promised to tackle the problem on a war footing by launching the World Index Finger Day. Face masks are becoming redundant. This has let to sharp cutbacks in production in some factories in a country to the North and East, that manufactures everything in the world. This, in turn, has led to labour unrest in some parts of that country. But, one man’s meat as another’s poison, they say. Designers are stepping in to fulfil the need of locals to wear masks, which they have become accustomed to, and without which they feel naked. It is the latest fashion accessory to be seen in, in high society. 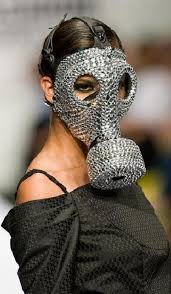 Here is an image of a socialite seen in a Prada mask at a popular event in Delhi. 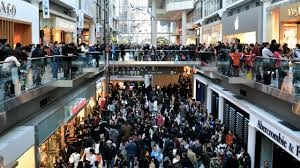 Shopping malls, as part of their CSR (Corporate Social Responsibility) effort, are stepping in to do their bit by inviting people to breathe in their bottled, recirculated air while they shop. A busy mall in the suburb of Gurgaon, abuzz with people eager for their “fix” of stale air. Car companies are eagerly awaiting their turn to do a good turn to society. Delhi CM Arvind Kejriwal, as has come to be expected of him, immediately announced relief for the beleaguered population by introducing the Odd-Even scheme. 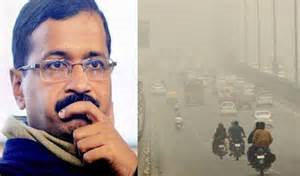 Readers of this blog might know that Mr. Kejriwal solves all issues with the help of his trusted Odd-Even scheme, be it excessive pollution, unmanageable traffic, or, as in this case, too little pollution. Under the new version of the scheme, the decommissioned coal-burning Indraprastha power plant would be restarted to give the Delhi air some of its mojo back. The new version is called Odd AND Even. The plant, once restarted will work on Odd days. AND on Even days. Being the good man as all politicians are, or become, the Delhi CM is reported to be deeply affected by the developments. In this image, with a wistful look, he is watching a video of the halcyon days of Delhi. Can he bring those days back? But there is good news. The Met department has forecast that rains will soon taper off and Delhi will return to its salad days of haze and smoke and smog and dust. If people who have left Delhi are reading this, please plan on coming back soon. We miss you. More than that, we miss our atmospheric pollution.